Managed to take some time off last week, and found ourselves hurtling under the Channel in a nostalgic search for flick-knives and Pelforth in Paris (actually more like a waistband-popping visit to Stohrer topped off by a fine Brouilly nowadays). 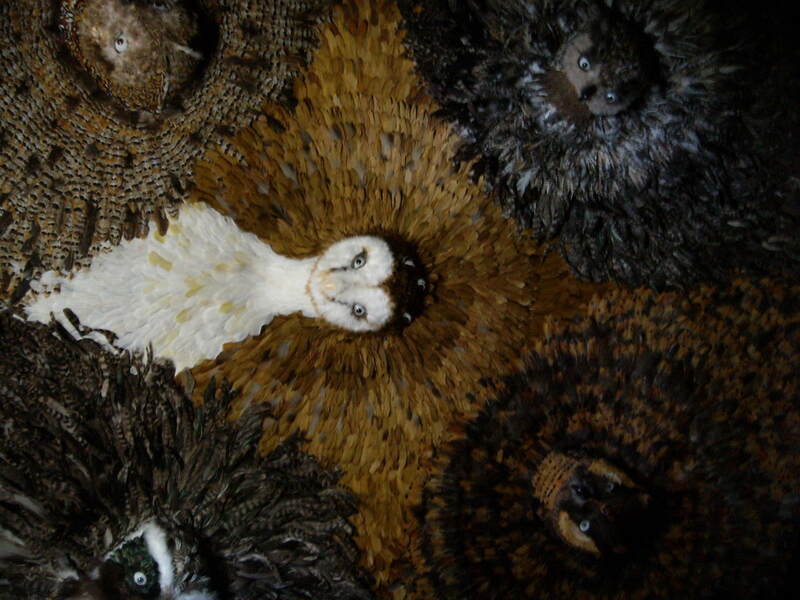 I wasn’t consciously looking for anything particularly yarn-related (apart from a couple of sneaky visits to La Droguerie and Cat’Laine) … but it found me anyway, nestling amongst a bunch of dead animals. Of course. Perhaps strangely for an animal lover and ex-vegetarian of 15 years, Musée de la Chasse et de la Nature is one of my favourite museums – apart from the fact that it’s an ideal place to take a tired 7-yr-old with a keen eye for taxidermy, it’s housed in the elegant 17th century Hôtel de Guénégaud, a traditionally Parisian backdrop against which to successfully blend both abstract pagan and rather more modern concepts. Even if the subject matter and room after room of glassy-eyed stuffed animals isn’t your thing, it’s hard not to get carried away by the theatricality of the exhibits and thoughtful display methods (although Jnr was justifiably freaked by the ceiling in the owl room). One of the chief delights is seeking out the wooden curiosity cabinets – which are works of art in themselves – devoted to various wild beasties: look through a pair of ‘binoculars’ and you’ll get a badger’s view of the forest; open a door and you’ll discover a child’s picture of a wolf accompanied by music; tug on a handle and slide out a 17th century engraving of a stag; pull out a heavy drawer and you’ll find an imprint of the animal’s faeces set into bronze. Hares, foxes, deer, wild boars … the essence of each is captured in these exquisite animal spirit repositories. The museum’s subject matter is subtly reflected in the fittings of the actual building, so climbing the marble staircase you put out a hand to steady yourself on curving metal branches, if you get lost a piece of roughly-hewn wood with naively-carved arrows will point you in the right direction, while your way is lit by pewter stag antler chandeliers. So you get it, I love the place and would happily spend hours in there soaking it all in. Except this time there was an extra reason to wax lyrical – an unexpected meandering installation, including four incredible knitted animals amongst the real ones. The polar bear, overhung with hundreds of glittering lights and placed on a shiny, oil-black floor was such an unexpected sight coming out of the darkness, we kept hearing small gasps behind us every time someone came into the room. I was trying to get closer to the exhibits to inspect the stitches and shaping methods but understandably they were roped off so I’m now poring over the pictures to see if I can get any more clues. I can tell you that the polar bear had a beautiful cable knit chest and stomach. There was no information about the creators and the museum staff seemed as much in the dark as we were (!) but a bit of post-visit research revealed the creators to be Marion Laval-Jeantet and Benoît Mangin, aka Art Orienté Objet – I’d love to find out more about the production methods, but I’m pretty sure they were hand knitted. What a wonderful place thanks for sharing.